Sally Watson has been a much loved author for decades of young readers. Starting with her first book, Highland Rebel in 1954, her strong-willed heroines fighting for their beliefs and livelihoods continue to be especially inspiring to young girls. Now Sally is continuing to entertain and educate adult readers too with her newest books. Born in 1924 in Seattle Washington, Sally grew up as an avid reader. Deciding on a non-traditional life for a woman at the time, Sally joined the Navy WAVES in 1944 and then attended Reed College in Oregon. Fortunately, once she was finally prompted to combine her love of history and writing, Highland Rebel poured out of her quickly and started her writing career in juvenile historical fiction. After the success of her first books, she traveled in Europe on the proceeds and learned Highland dancing. At age 45, while continuing to write, she learned Judo, eventually earning a black belt. When the book market changed in 1972, Sally stopped writing for about 30 years, but then her fans persuaded her to start again. 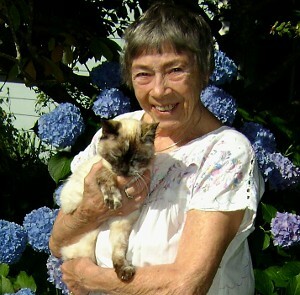 So now, at age 90, Sally continues to enchant readers with new books and is also very active with cat rescue.